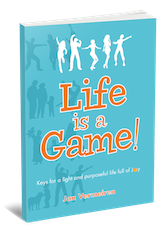 In the book Life is a Game! you’ve found several ways to release stress and to transform your monsters into teddy bears. We hope it is clear that in principle you don’t need anyone else. However, sometimes there are situations where one could use some support and more professional help. That is why we created this directory of coaches, therapists, facilitators and healers. So if you need any help with one or more of the techniques or models from the book or just are open for any technique and want to find someone neutral to your situation in your neighborhood, search the directory. 1) Coaches, therapists, healers and facilitators can put their contact details on the website for free. The reason that this service is provided is that we want to have anyone in the world to have access to at least some other person who can support him or her. 2) We haven’t screened them so always follow your gut feeling about whether or not to work with someone. If it helps you to make a better decision, look at their website, LinkedIn page or Facebook page first or ask for an intake/interview or references. 3) People are adding their contact details daily, so please go back on a regular basis to see if there is someone new in your area with a particular specialty.